Major League Baseball released the All Star Ballots obscenely early this year, about 3 weeks into the season. Below is a link from April 24th. At a Yankee game a week later, I grabbed a few ballots. Filling out a ballpark at the ballgame is fun, but most fans don't check stats while making choices. The nuances of their mindset is fascinating. Fans voting at a ballpark will select players they think should start the All Star Game or players they like the most. If they choose to vote on merit over affinity, they still may be overrating the performance of their selections. Sitting at home, we have a chance to fill out a ballot with more information. 9 1/2 weeks of baseball is too small of a sample size to attribute much value to aggregate stats, such as WAR and various defensive metrics. The title to this post is an exagerration, but we're going to look at All Star teams from various perspectives. How would the construction of one-dimensional teams look? Note: the official ballot only allows for one write-in vote in each league. We will affix a "(W)" to write-in's. OBP is a stat that doesn't stabilize until 500 plate appearances. To reiterate, these are unique ways of looking at the All-Star ballot, not a statistical exercise to measure player value. Looking at Defensive Runs Saved calls for FIVE right-in votes, but the aforementioned limit made us exclude Diamondback teammates, Gerardo Parra and A.J. Pollock, as well as Craig Gentry of the Rangers. Highlighting an Astros player is bittersweet. We enjoy rooting for the Astros, and Brandon Barnes has looked like a really good defensive Center Fielder. Suddenly, it's clear to me that we may not see a Cubs player make it to the top of any of these groups. We aren't looking at lefty/righty platoon splits, althought the Cubs have some nice platoons at work. Speaking of platoon splits and Cubs, former Cub Jeff Baker leads all of Major League Baseball with an .889 slugging percentage versus lefties. Count me among those excited for when Andrelton Simmons will have played enough innings to make his defensive statistics significant. He is a world class defender and makes Gold Glove caliber shortstop look easy. 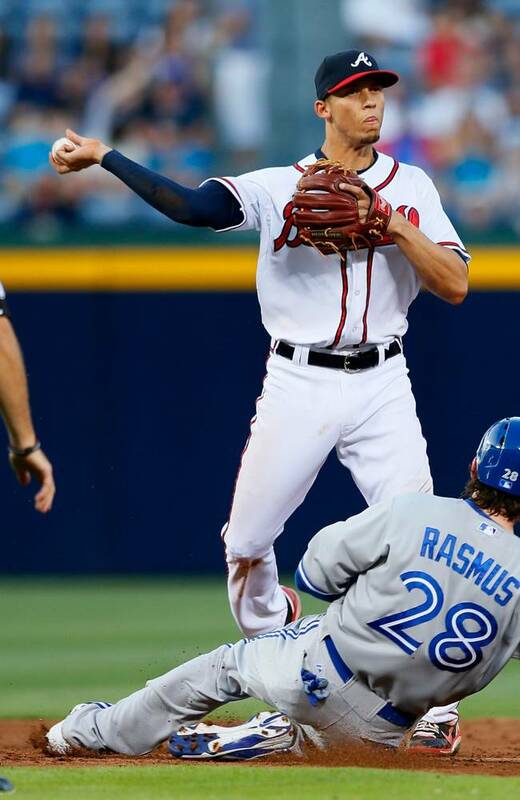 Andrelton Simmons throws with an effortless fluidity that accentuates the reliability of his arm. Troy Tulowitzki is now third in the majors in wRC+ at 178, behind only Davis/Cabrera, neither of whom are shortstops. The best hitter in baseball, Miguel Cabrera, overshadows a breakout by Josh Donaldson, who places second in the American League with a 155 wRC+. Evan Gattis has a 155 wRC+ and is slugging like Paul Goldschmidt. Unfortunately for our decision, he's been too much of a part-time catcher to merit selection over superstar Buster Posey. Good on Coco Crisp. He's known for his defense and baserunning, yet he shows up in this small sample wRC+ query. Mark Trumbo, of the Angels, suffers the same as Evan Gattis above. He has a 136 wRC+, but he has a couple of issues that hold him behind Jose Buatista. First, Trumbo is on the ballot as a DH. Second, he's spent a good amount of time at first base. CarGo and Cuddyer also made the NL team with OBP. Using wRC+, Bryce Harper replaces Shin-Soo Choo. Where's Domonic Brown? His 145 wRC+ falls short, mainly due to his .320 OBP. It's also surprising to see the AL outfield's wRC+'s dwarfed by their NL counterparts. Donaldson is overshadowed again by Cabrera. This time, his .334 TAv is the second highest by a third baseman in Major League Baseball. The top six third basemen in TAv are in the American League. Collectively, as we saw above, AL third basement are terrible baserunners. Carlos Santana, Goldschmidt, and Kinsler make their first appearances here, but TAv is a very well respected statistic, when it comes to True Talent. It'll be interesting to see if the players highlighted by TAv have better second and third acts to the season than players who stood out in less meaningful metrics. No surprise to see Ortiz shining once again. Remember when he was completely "done"? It was exactly four years ago today that Big Papi hit his nadir. On the morning of June 6, 2009, David Ortiz was batting .188/.281/.288 with 1 home run and 52 strikouts. Writers, fans, and talking heads wondered if the Red Sox could just ask Big Papi to go home. In the four calendar years since his low point, David Ortiz has hit an additional 121 home runs. Since the start of the 2010 season, David Ortiz is batting .300/.393/.565. It's talent and hard work, not scientists, that are responsible for Ortiz's fabulous production in his late-30's. Right? Zobrist is a super utility player, but he is listed at second base on the ballot, has played most of this season at second base, and has a sizeable enough lead against the next closest second baseman (Robinson Cano 15.5 OBI%). This Ryan Zimmerman stat points out that timely hitting is one of the reasons why the Nationals are near .500 in spite of their lousy offense. More Big Papi! He'll cruise to his ninth All-Star Game, as he surpassed a million votes before any other DH cracked 700,000. Marlon Byrd makes it into this post, and still there's no Cubs player to be found. We don't condone gambling, but it's likely that someone can win a bar bet with the knowledge that Freddie Freeman has the best OBI% in all of baseball. Our last arbitrary parspective will be with the percentage of batter's balls in play are line drives. Line Drive Rate is one of the few statistics that stabilizes with just 150 plate appearances. The same way Don Cooper can convert a failed starter into a 15-game winner, the Rays have a knack for finding first basemen who couldn't hit "send" and turning them into Don Mattingly clones. This year, Loney is batting .324/.390/.516. Those are better than Nomar Garciaparra's career numbers. It's only 211 plate appearances for Loney, but after what Casey Kotchman did with the 2011 Rays, Loney may have a similar run. According the Baseball-Reference, Casey Kotchman's offensive production in the 2011 season is an outlier. Over his 10-year career, Casey Kotchman generated 3.6 of Offensive Wins Above Replacement. 3.4 of those Wins were from the 2011 season alone. This exercise has brought to attention the depth of the second base position in the American League. Personally, I think that Robinson Cano is the best second baseman in the world. However, he hasn't come up once in any of the statistical perspectives we looked at today. Cano leads AL second basemen in home runs and RBI, but that's about it. For his outstanding line drive rate, Howie Kendrick becomes the fifth second basemen highlighted today, joining Pedroia, Ackley, Kinsler, and Zobrist. This probably explains one of the most likely reasons why Chris Johnson is one of the most impatient hitters in the Major Leagues. He expects to hit line drives. How about that?! After giving up all hope in seeing a Cubs player at the top of any of these statistical categories, Nate Schierholtz, of all people, makes an apperance. Because Garrett Jones spends much more time at first base than in the outfield, his 24.6 LD% wasn't enough to vault him ahead of Schierholtz's 24.4%. In conclusion, we're filling out 2013 All-Star Ballot as follows. How are you filling out yours? Adrian Beltre has the toughest draw of all present day stars. Make no mistake, not only is Adrian Beltre is an All Star; he's a SUPERSTAR! He's simply at the same position, and in the same league, as the best hitter in baseball. Here is where you may vote up to 25 times online. Voting closes at 11:59 PM on July 4, 2013. Vote now!